Big Cypress National Preserve is a vast land of primeval beauty unlike any other in the United States. When folks think about the swamps of south Florida, the Everglades is the first image that comes to mind. However, the vast wet-lands of hammocks, marshes and bogs are in fact two separate ecosystems. The Big Cypress and the Everglades. 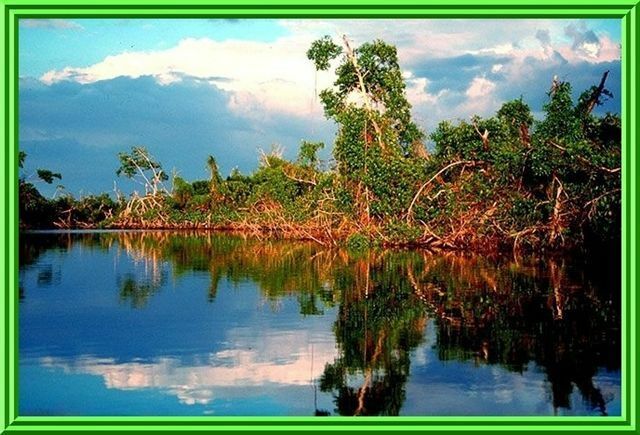 The Big Cypress is a couple of feet higher in elevation and is known as a peninsular divide, with the water flowing in different directions on either side and separates the two ecosystems. The broad savannas of the Everglades gives way to the uplands and tree hammocks in the Big Cypress and about one third of it is covered with cypress trees. 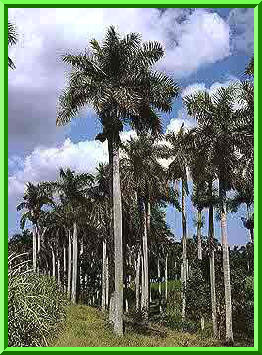 There are islands of slash pine mixed with the hardwood hammocks of gumbo-limbo, coco plum, strangler fig, oak and maple. Bromeliads like the many tilliandsias and orchids live on the hammock and cypress trees. The cattail, hemp-vine, lilly-ribbion and black head rush thrive out on the wet prairies. 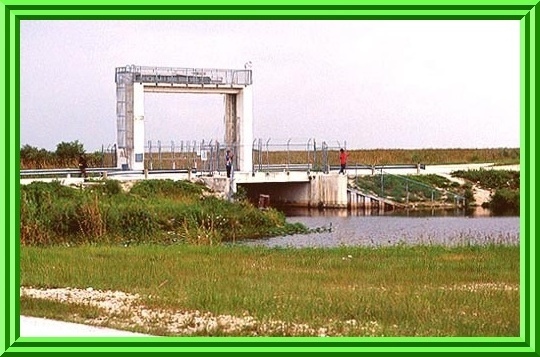 Before the canals were dug, the Everglades received its source of water from Lake Okeechobee. Today, most of that water is diverted through canals. The Big Cypress has no outside source of water; over 97% of its water is supplied by rain, with sixty inches of rainfall in an average year. The most significant difference between the two ecosystems is that the Everglades is ill. Farms and chemical run-off, diversion of water from Lake Okeechobee, and encroaching development from the east cost of Florida has reduced the Everglades to about one-half of its original size. On the other hand, the Big Cypress is healthy and much larger than the Everglades with over 2,400 square miles of subtropical acerage. 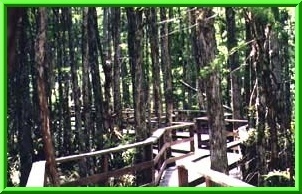 The name "Big Cypress" defines the size of the area not the size of the trees. Most trees in the Big Cypress are Dwarf Pond Cypress... shadows of the once-huge cypress trees in the preserve that were logged out between 1920 through 1950. Today, the Big Cypress National Preserve consists of 728,000 acres located in Collier and Lee Counties in south west Florida. The Big Cypress Watershed area benefits from a long history of preservation efforts. It is owned by the governments of Florida and the United States, and is surrounded by the Everglades National Park, the Fakahatchee Strand State Preserve, the National Panther Refuge, the Rookery Bay National Estuarine Research Reserve, and the aquatic preserves. All of these combine to protect the pristine Big Cypress Watershed from development. Creating the Big Cypress National Preserve was quite the undertaking. Former assistant Secretary of the Interior, Nathaniel Reed, describes the Big Cypress story as..."chaotic, wonderful, and full of twists and turns." To convince the public and our elected officials that the Big Cypress was worthy of saving. To put an area as large as the state of Delaware into a single management unity, to track down the 35,000 to 50,000 indivudals who may or may not, hold title to the land and negotiate settlements, was a major task. If it had not been for the hard work of conservationists, Big Cypress's future would have been in the hands of developers. By the time conservationists became concerned about the Big Cypress in the late 1960s, it had already been logged out. The giant Bald Cypress that had sprouted at the time of the Magna Charta and, were already bearded with moss when Christopher Columbus discovered the New World, were cut down. Four hundred million board foot of pine timber, and three hundred sixty million board foot of Cypress were logged from the Big Cypress before it became a preserve. Oil had been discovered on Bear Island, and many drill sites were in the process of construction, criss-crossing the Big Cypress with roads that interrupted the natural flow of ground water. One old timer put it this way, "Thinkin 'bout a movin' on, there's no peace left in this country anymore, just for the noise of all that machinery running." On the western edge of Big Cypress, the Gulf American Land Corporation was cutting out twenty foot swaths through the cypress trees to create the town of Golden Gate Estates. After the swaths were cut... roads created and drainage canals dug, the area was parched and lifeless for miles around. "The Wilderness has been Pushed Aside," proclaimed one promotional brochure. "With calipers and slide rules, draglines and dynamite rigs, we are literally changing the face of Florida." And they Did! In 1968, when the plans for a huge Jetport in Big Cypress were unveiled, it touched off a rash of speculative land sales driving up prices of the once worthless swamplands more than ten-fold. 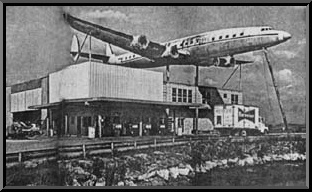 The Jetport was going to be located mis-way between Miami and Naples along the Tamiami Trail (Hwy 41). It was going to change everything. The Jetport was going to be the biggest airport in the world, with the longest runway in the world... and that was going to change aviation. It was going to generate five million gallons of sewage and industrial wastes, and more than 25 tons of jet fuel pollutants each day. The plan also included a "high speed airconditioned bus', traveling between 150 to 200 miles pre hour, connecting the east coast of Florida with the west coast of Florida. These plans, if fully developed, would have devasted the Everglades National Park, not to mention the Big Cypress. At the ground breaking ceremony for the Jetport, Chief Buffalo Tiger, Chairman of the Miccosukee Indians said, "Indians have always given way, moving away from all the progress in search of peace and quiet, but now there is no place left to go." The developmen was proceeding smoothly until Robert Padrick, Chairman of the Central Southern Florida Flood Control District, voiced his concern that the road and transportation corridor would pass through Conservation District #3. When Nathaniel Reed, envirommental advisor to Florida Governor Claude Kirk Jr., and Art Marshall, ecologist, researcher and teacher at the University of Miami, looked at the hydrological maps they didn't like what they saw. "The series of events that stopped the Jetport were created by a diverse group of people whose personal and political goals coincided at a time when environmentalism was a brand new idea," stated Joe Browder, who was the Southwest Representative of the Audubon Society at that time and later became the first Conservation Director of Friends of the Earth. He kept the Big Cypress issue alive at the national level. 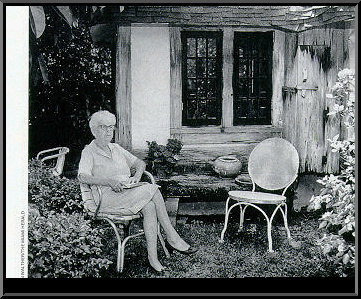 Marjory Stoneman-Douglas had gained fame with her book on the Everglades called "River of Grass," but at that time. she wasn't the outspoken environmentalist she was to become years later. Narjory had been involved in the creation of the Everglades National Park and she understood that the land of the Big Cypress had been intended to be part of the Everglades. She was there when Ernest Coe, "The Prophet and unmistakable founder" of the Everglades National Park, walked out in disgust when he realized that his vision of the park would not include the Big Cypress, the Keys, and much of the off-shore reef territory. It was not until Joe Browder convinced Marjory that she could use the fame she had acheived with her book to speak out on the issue of saving the Big Cypress. It was the Big Cypress that began Marjory Stoneman-Douglas's lifetime career as an outspoken environmentlist. 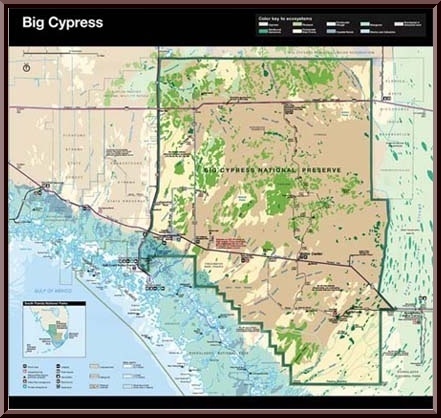 The fight to save Big Cypress from development required serious scientific studies of the ecology and caused the passage of the National Environmental Policy Act, the Florida Water Resoutces Act, and the Florida Land Conservation Act. Without these Acts, the fight today to save the Everglades and other environmentally sensitive areas, would have little precedent on which to stand. 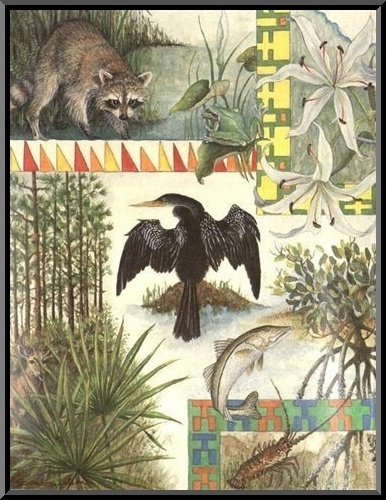 In April of 1972, Florida Governor Reubin Askew went before the Senate Interior Sub-committee on Parks and Recreation to request the help from the Federal Government to save and aquire the Big Cypress Preserve and to ensure the preservation, conservation, and protection of the natural scenery, the floral and fauna... and the recreational values of the Big Cypress Watershed and to protect the area as a source of water to the Everglades National Park and Collier County. "There must be progress, but we must ask ourselves what kind of progress do we want, and what price we want to pay for it. If, in the name of progress, we want to destroy everything beautiful in our world and contaminate the air we breathe and the water we drink, then we are in serious trouble." "The Big Cypress is jeopardized by the pressure for progress based on sometimes well-intended but too often ill-planned development... the fate of the broad, flat, very gently sloping watershed in Southwest Florida hangs in precarious balance, the Big Cypress has the potential for becoming a textbook or classic example of ecological ruin if we don't save it." The man who helped us was Bill Schoelerman, known on the Loop Road as 'Gator Bill', and considered by the National Park Service to be the leader of the poachers who hunted alligators in the Everglades National Park." The contribution of $40 million for the Big Cypress Preserve coming from the State of Florida garnered the support in Congress... and in 1974 Congress passed the bill and sent it to President Richard Nixion authorizing the Federal Government to spend $150 million to purchase the Big Cypress National Preserve on October 11, 1974, under the leadership of President Gerald Ford, the Big Cypress National Preserve came into being. Fakahatchee Strand State Preserve is located north of Everglades City and lies adjacent to the western border of the Big Cypress National Preserve. 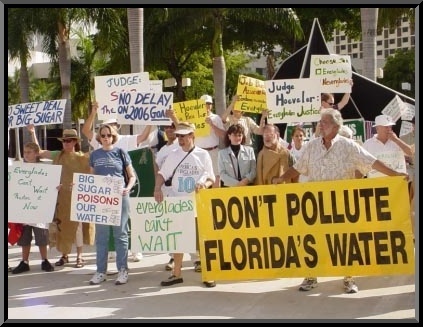 It is owned by the Florida Department of Environmental Protection. The Strand's 74,000 acres are part of the main drainage slough of the Big Cypress Swamp. A 2,000-foot-long boardwalk at Big Cypress Bend, accessible via the US 41 (Tamiami Trail), winds through old growth cypress swamplands. Trails on old logging tram-roads, remaining from past lumbering operations in the early 1900s, also provide access to the preserve. Fakahatchee Strand State Preserve contains the largest stand of native Royal Palms and is home to many rare species of bromeliads and orchids. Many endangered or threatened animal species such as the Florida Panther, Florida Black Bear and Wood Storks are found here as well. 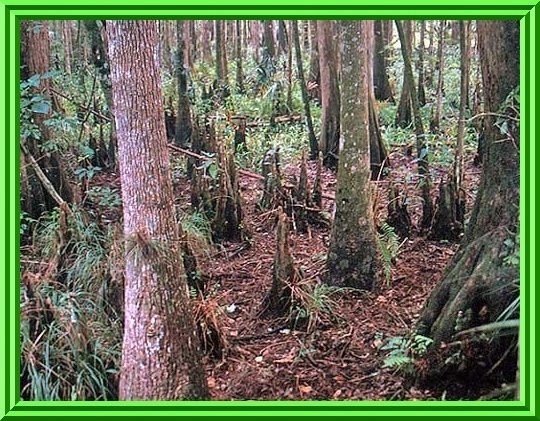 The Fakahatchee Strand is a linear swamp forest, approximately twenty miles long by five miles wide and oriented from north to south. It has been sculpted by the movement of water for thousands of years and clean fresh water is the key to its existence. Beneath a protective canopy of bald cypress trees, flows a slow moving shallow river or slough that is warmer than the ambient temperature in winter and cooler in summer. The buffering effect of the slough and the deeper lakes that punctuate it shield the forest interior from extreme cold temperatures and this fosters a high level of rare and endangered tropical plant species. The Fakahatchee Strand Preserve State Park hosts a wide selection of habitats and forest types from the wetter swamps and prairies to the drier islands of tropical hardwood hammocks and pine rock lands. Its groves of Native Royal Palms are the most abundant in the State and the ecosystem of the Fakahatchee Strand is the only place in the world where Bald Cypress trees and Royal Palms share the same forest canopy. It is the Orchid and Bromeliad capital of the continent with 44 native orchids and 14 native bromeliad species. Florida Panthers still pursue the white-tailed deer from the uplands across the wetlands. Florida Black Bears and Eastern Indigo snakes, Everglades Minks and Diamondback Terrapins can still be found here. The resident and migratory bird life is spectacular and attracts thousands of visitors every year. Changes on an ecosystem-wide level are predicted to occur within the Fakahatchee Strand over the coming decades as the Comprehensive Everglades Restoration Plan (CERP) is implemented. The restoration of the Prairie Canal, which defines the western border of the Preserve is an especially important aspect of CERP. For almost a half a century, the Prairie Canal has hastened the drainage of water that the native plant and animal communities of the Fakahatchee Strand depend on. Once the Prairie Canal is completely filled in, the surface water will move across the landscape, draining slowly instead of poring into bigger canals and gushing into the estuaries of the 10,000 Islands. It will recharge groundwater and pass through the natural filtration processes of swamps, prairies, marshes and mangroves before gradually mixing with salt water. It is and will continue to be an important source of fresh water for human and natural communities. The southern portion of the Fakahatchee Strand Preserve is a part of one of the most productive estuarine systems in the world. Beneath the surface, where fresh water gradually becomes more saline, ideal conditions exist for spawning and the development of the fry of commercially and recreationally important fish species. Rookeries of wading birds color the landscape with dots of white, blue and pink. Canoeeists and kayakers enjoy the scenic beauty while anglers ply the mangrove backwaters for snook, snapper, tarpon and redfish. West Indian Manatees float in slow motion while American Crocodiles carry on their secretive existance, slopping in and out of the tannic water to bask in the sun. 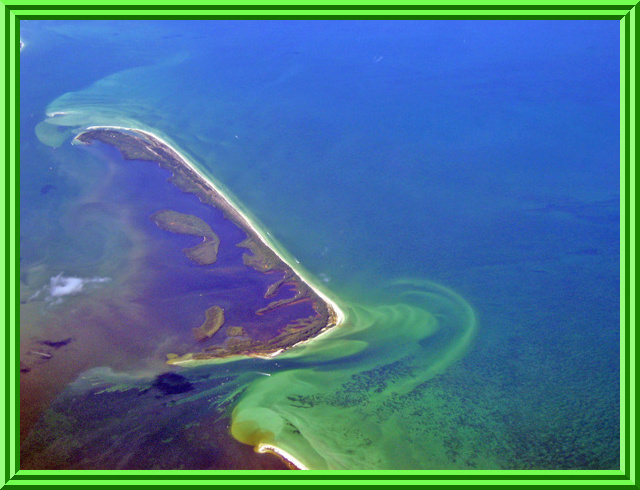 On the coastal keys of the Ten Thousand Islands, loggehead and green sea turtles return annually to nest an the same spits of white sand beach from which they themselves once emarged. In spite of the ecological damage visited upon the Fakahatchee Strand in the past by clear-cut logging, road building and drainage... it has recovered remarkably well and remains a fairly intact and funcitional natural system. The raised railway beds or trams of the old logging trains still crisscross the Fakahatchee Strand and they create a grid of trails, many of which are maintained for hiking. The Big Cypress Bend Boardwalk provides visitors a glimpse into the past as it winds through a stand of primary cypress forest The Fakahatchee Strand is an ecological gem. It has much to offer and every season presents different opportunities for visitors. The one-half-mile boardwalk at Fakahatchee Strand Preserve State Park is an opportunity to see rare plants, bald cypress trees and North America's largest stand of Royal Palms and the largest concentration and variety of epiphytic orchids, including 31 varieties of treatened and endangered species that bloom most extravagantly in the hotter months. From November to April... the park's rookery, accessed down a short road 2 miles east of the boardwalk. The sight of 5,000 to 7,000 wading birds returning to roost for the night is spectacular.! You can also drive through the 12 mile long W.J. James Memorial Scenic Drive and hike the spur trails that lead off it. Ranger-led swamp walks are given November through February at the Boardwalk on the horth side of the Tamiami Trail 7 miles west of Route 29; Rookery on the South Side of the Trail 5 miles west of Route 29, and the Ranger Station is on W.J. James Scenic Drive.